John McCormack, former Speaker of the House. John W. McCormack, a Massachusetts congressman for four decades and speaker of the US House of Representatives from 1962 to 1971, was born 125 years ago today. And while his long life ended 36 years ago, we are all still beneficiaries of its fruits. Modest and soft-spoken, McCormack never sought the limelight. No biography has yet been published, though one is expected next year. But it is fair to say that no member of Congress in the 20th century accomplished more that affects the everyday lives of nearly every American today. McCormack would doubtless take pride in the continuing effectiveness of Social Security, Medicare, and Medicaid to provide people with a real safety net. He would have reveled in the fact that Barack Obama, a beneficiary of civil and voting rights legislation of the 1960s, became president; he would have supported the many education, housing and aid programs that continue to promote economic opportunity and social justice. All these policies owe a debt to McCormack — a doer if there ever was one. McCormack was the seventh of eight US House speakers to come from Massachusetts — no other state has sent more than four (Kentucky and Virginia). 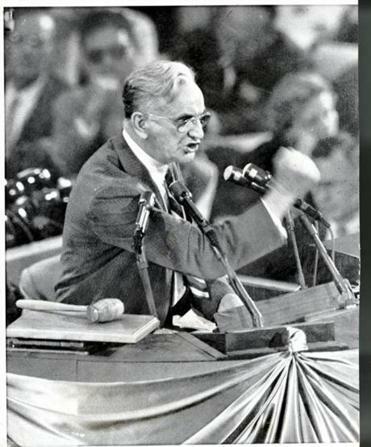 That McCormack would rise to that position and become one of the most effective legislators in American history — and next in line to the presidency for 14 terrible months from 1963 to 1965 – would have seemed unthinkable when, in 1904, he dropped out of grade school at age 13 and took a job as a newsboy to support his mother and siblings. But there were many exceptional aspects to McCormack’s life story. After interning in a law office, he passed the bar, and at 21 became the last person in Massachusetts to become a lawyer without so much as a high school diploma. He served in the Massachusetts House and Senate before winning a seat in Congress in 1928. Speaker John Nance Garner of Texas made him the youngest member of the Ways and Means Committee in 1931. This was the first hint of the Austin-to-Boston power axis that was to dominate the House leadership for half a century. And it was also where McCormack got a taste of serious policymaking, as he helped enact Franklin Roosevelt’s landmark Social Security initiative. There followed significant roles in the passage of a long list of transformative legislation: the GI Bill, the minimum wage, Medicare, Medicaid, immigration reform, and rent subsidies for low-income families. McCormack’s focus was not exclusively domestic. Early in 1944, during his time as majority leader, he was deputized by Speaker Sam Rayburn to receive a top-secret briefing on the development of the atomic bomb, and then to find a way for Congress to appropriate $600 million to build it, without anyone knowing what the money was for. McCormack was speaker when President John Kennedy, his one-time colleague in the Massachusetts congressional delegation, was assassinated, and he helped Lyndon Johnson move the nation forward. A key part of that history was the enactment of the Civil Rights Act of 1964. McCormack played a crucial part: when his Rules Committee chairman, a Virginian, threatened to kill the bill by delaying action, McCormack took the extraordinary step of joining a move to discharge his own committee, and the legislation was soon on its way. A proud son of South Boston, McCormack had already seen to it that a congressman who was in line to become the first black committee chairman was not derailed by conservative southerners. McCormack also desegregated a House barber shop that had refused black staffers. There are monuments to McCormack in Boston — the federal building in Post Office Square, a state office building on Beacon Hill. There is also the McCormack Middle School on Columbia Point. But perhaps the most vibrant reminder of his productive career is the John W. McCormack Graduate School of Policy and Global Studies at UMass Boston. Deeply aligned with McCormack’s legacy, the school’s mission is grounded in the belief that knowledge, cutting-edge research and academic inquiry can drive better public policy that improves governance, strengthens communities, remedies injustices, and improves lives. Its nationally and internationally recognized scholars conduct research that is fundamentally linked to action — action that is modeled by leaders and public servants such as John W. McCormack. David W. Cash is dean of the John W. McCormack Graduate School of Policy and Global Studies at the University of Massachusetts Boston.